Grills Blue but there are little holes on each grill there are nothing to affect the performance of these speakers. Used in beautiful looking condition Sound Great Heavy speakers H-28.0” W-15.0” D-12.0” Weight 42.0 Lb each x 2 = 84.0 Lb You get two speakers on the pictures Location pick up only Rockville MD 20852 Thank you! 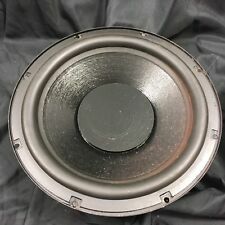 THIS POLK AUDIO SUB WOOFER ISSOLD . FOR ITS AGE, THIS PASSIVEPOLK AUDIO MONITOR 6, SERIES 2 SUB WOOFER APPEARS TO HAVE BEEN REASONABLY WELL MAINTAINED. THIS SUB WOOFER HAS BEEN TESTED. THIS SUB WOOFER IS IN. This original item is pulled from a damaged cabinet. 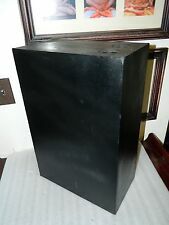 It is a passive radiator, it only moves in conjunction with the other speakers. Comes professionally packed and fully insured. Good working condition as pictured. Speakers work and sound great with a nice lower end frequency response as well as the high crisp image. It's a real thing nothing cheap, made of very heavy and solid MDF. Make: Polk Audio. Model: Monitor 10 / M10. Made in the USA.